One of the best things you can do in Chiang Mai is renting a scooter. This gives you the freedom to explore the city and go to places, where the organised tours normally don’t go. Once you feel a little bit more confident with the hectic traffic and with your own vehicle you might want to drive a little outside of the city. 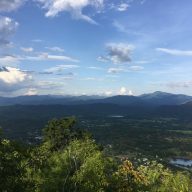 There are a lot of motorbike routes around Chiang Mai, each a little bit different in terms of difficulty and activities you can do along the way. One of the day trips I would recommend for the beginners is the Samoeng Loop – a pretty easy ride with spectacular views. This is one of the things I had wanted to do for a long time, but there was always something else to do, other places to see. Last year I ventured out by myself and reached the Samoeng Forest, but I decided not to drive further. I was a little scared of the coming storm and not an experienced driver at that time. But this time I was more confident and I had a lovely partner to go with. We chose one Saturday, jumped on the scooter and drove into the mountains. 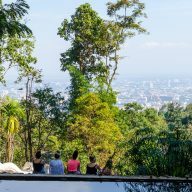 The Samoeng Loop starts and ends in Chiang Mai. 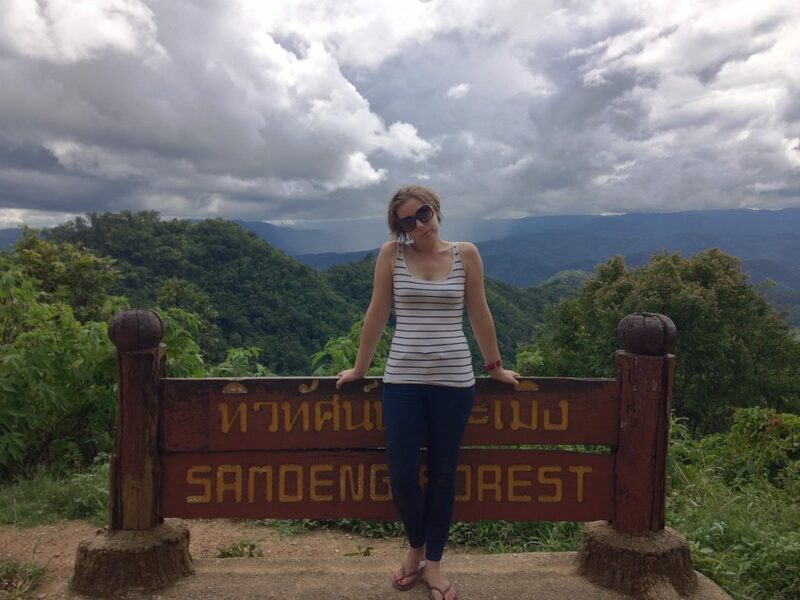 It is about 100 km long and goes through the town of Mae Rim, Mae Sa Valley and Samoeng town. It takes approximately 4-5 hours if you don’t stop too often. It is worth remembering that there are a lot of things to see and do on the way, so your trip will most definitely take longer. There are two ways to start the loop: clockwise or counter-clockwise. We chose the latter option and I would recommend everyone to do the same as it is more interesting and there are more places to stop. Take the road number 107 to Mae Rim. It is a busy part of the trip. The traffic is heavy around Mae Rim, so be careful and wear a helmet. After a bit, you will reach the town of Mae Rim. Drive for another 10 minutes until you see the signs pointing left to the Mae Sa Valley and Mae Sa Waterfall. Take that turn and drive straight. From that point, the road will become less frequented by cars and you will be able to finally relax. 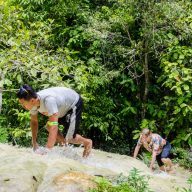 Your first stop should be the Mae Sa Waterfall. 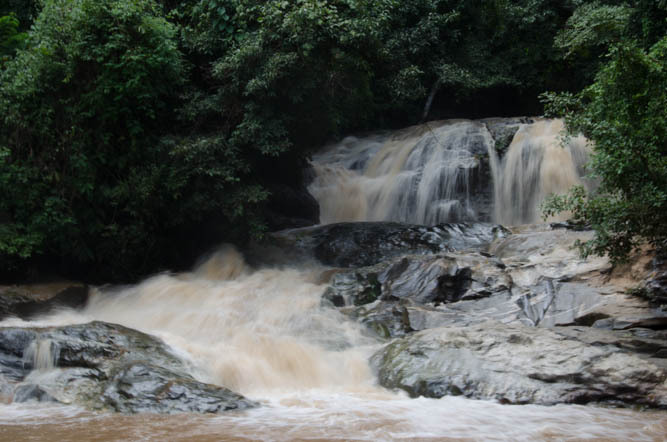 Chiang Mai area has a lot of waterfalls, some are not worth a visit, but this one should not be missed. You will reach this site after driving for about 5 minutes after the left turn in Mae Rim. It is very well sign-posted and clearly visible. You will have to pay 100 Baht entrance fee and 20 Baht for a motorbike. Park your ride at the parking number 3 as it is closer to the waterfall and you don’t have to walk too much, which might be a bit of a struggle, especially if it’s really hot. There are a few food and drinks stalls at the entrance. Make sure you buy some water and some snacks if you plan to stay there a little longer. The toilets are located at the parking area and in the midsection of the waterfall. From the parking, you will begin a slow walk up the stairs. Mae Sa waterfall has 10 levels and is the biggest waterfall in the area. During the hot season, it is a great place to have a dip in the shallow waters on level 5 – do not attempt to swim at the other levels, it is far too dangerous. You can wear a bikini, or shorts, without being afraid of offending anyone. Thais, who swim there, wear t-shirts and shorts, but they are used to seeing foreigners wearing skimpy clothes. Rainy season is also a great time to visit the place. The forest is very green at that time and there is much more water flowing, making the waterfall look spectacular. Watch out for unexpected flooding and very slippery floor. Level 5 and the lower levels are good spots for a picnic and you will see a lot of locals doing so. Once you leave the waterfall you need to go left and drive up the hill. There are a lot of attractions on the way like Monkey World, Elephant Camp and a snake farm – however, animal activists have been stressing that these places do not treat animals well, so if you care about animal welfare you should avoid them. 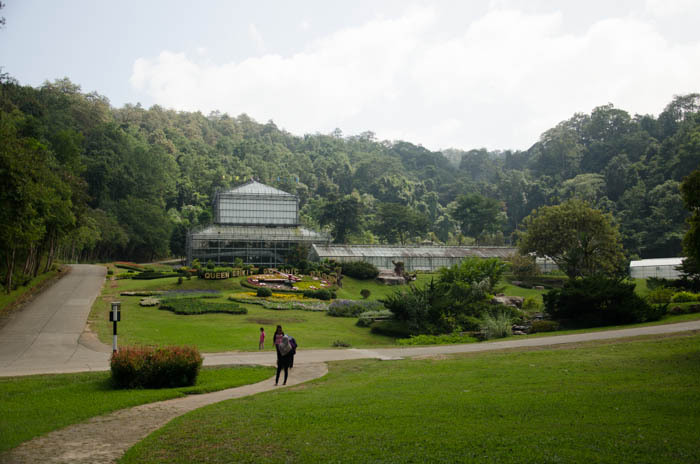 Next on the way are the Queen Sirikit Botanic Gardens. If you are a flower enthusiast, or just like pretty places, this is a stop worth taking. The entrance fee is another 100 Baht. The gardens are large and it is best to explore them on your motorbike. This time we didn’t stop there as I visited it last year. After you feel like you’ve seen enough of banyan trees and orchids, drive up the mountain again. You will pass a couple of small villages and towns. There are no sights to visit, but you can stop for a coffee, or gas and just watch the local life. Usually, those settlements are very quiet and peaceful and make a great, relaxing break. You will reach the Samoeng Forest after around 20-30 minutes. You can stop on the way, but make sure not to park your bike just after or before a curve and always look around when crossing the street. 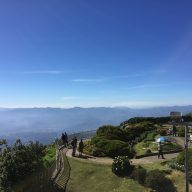 If you prefer to admire the views in a total safety then drive a little further until you reach the viewpoint. 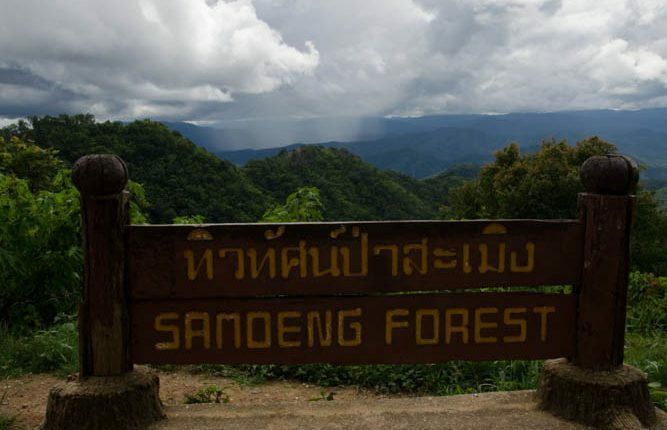 There is a nice, wooden sign welcoming you to the Samoeng Forest and Samoeng Loop. The view over the mountains is stunning and it is a great place to take photos. I may not look happy but, trust me, I was! Driving further will get you to the town of Samoeng. It is a tiny place, where nothing much is going on. There are places to eat and surprisingly some of them have English menus. There is only one place to stay – the Samoeng Bungalows, located a little outside of the city. 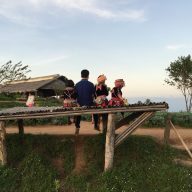 Samoeng is a great place for day trips to the local villages. There are a couple of roads going in different directions. Whichever you decide to choose it will take you to some nice places. We didn’t have that much time, so decided to head west, on road 5032. 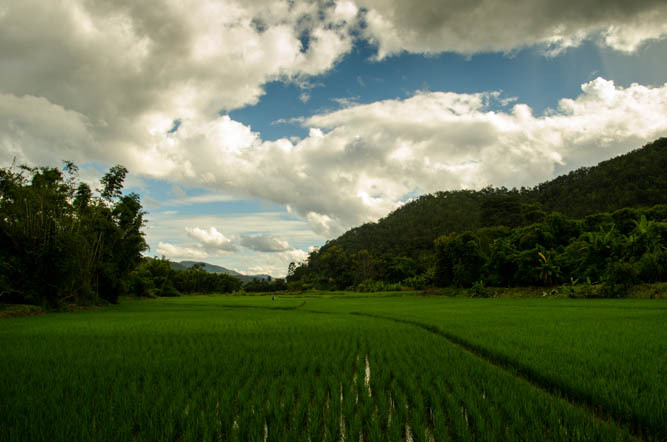 The road led us through some rice fields, but except that it wasn’t very spectacular – just a nice, country road in Thailand. It was still nice driving on it and just enjoy the sense of freedom. After a bit, we stumbled upon a road leading to the Mae Sap Cave. 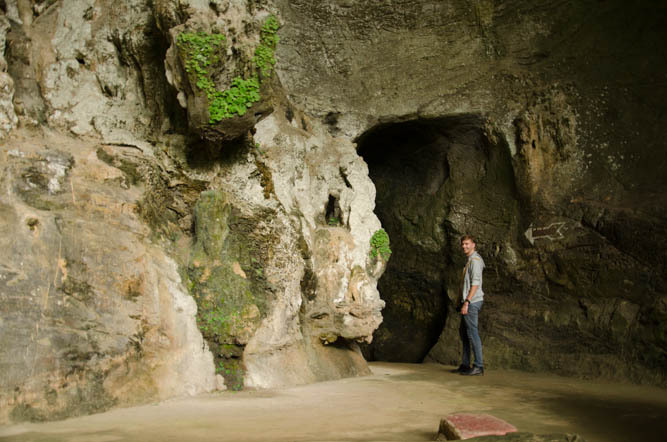 We had no idea what it was, but caves are always fun, so we decided to have a look. The area was deserted. There was no one around, except some sick looking dogs, guarding a small hut where, as I assumed, someone who looked after the cave lived. It is quite a spectacular spot. 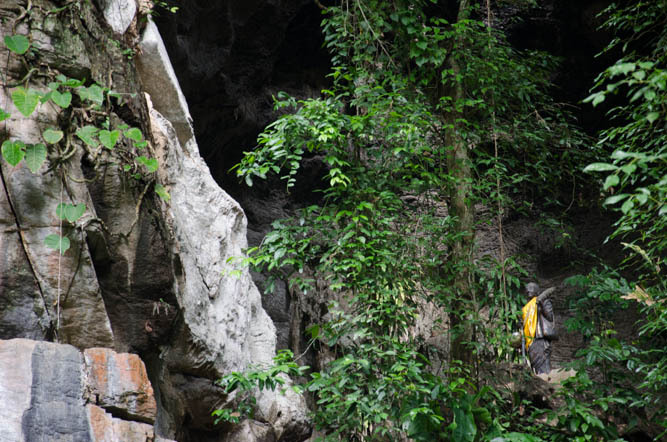 The cave is located on a tall mountain and surrounded by lush green forest. You need to climb some steep, old stairs to reach the entrance to the cave. Just outside of it there is a statue of a monk who used to lead a life of a hermit here. The entrance is very spacious. There are a couple of rocks where you can sit down and rest, and admire the surroundings. 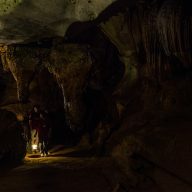 The inside of the Mae Sap Cave is entirely dark. We only noticed on our way back that you can rent torches for 20 Baht from the previously mentioned hut. After spending some time in the cave and taking hundreds of photos, we decided to head back. I craved coffee, so we stopped at a tiny cafe by the road, near Samoeng. 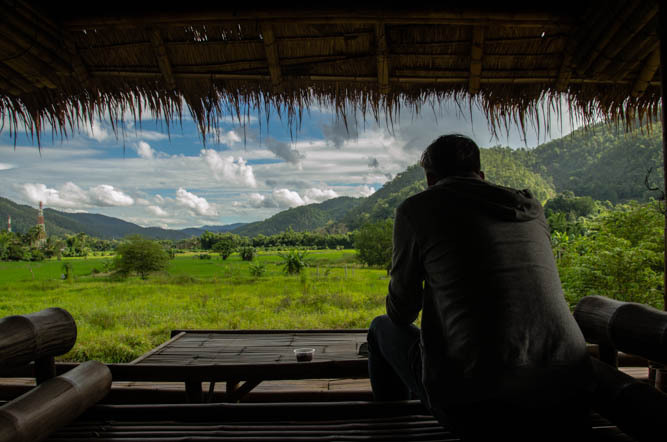 It didn’t really look like anything special when we had passed it on the way to the cave, but once we went upstairs, to the terrace, it turned out that the place had amazing views over the rice fields and mountains. If you stumble upon this place, on the road 5032, stop by and have a drink here. The drinks are not very good, but the view is worth spending the money. This area is also famous for strawberry farms, and strawberry products are everywhere. The cafe sold jams, dried fruit, and even strawberry wines. The trip took us a whole day and we got back home around 6 – 6 hours in total. It is better to get gas for your scooter in Mae Rim, or Chiang Mai. In Mae Sa Valley there are a couple of points, where you can buy petrol. These are not petrol stations, but small self-service gas tanks, which are usually located next to small grocery shops. Once you reach Samoeng there is at least one petrol station. There are plenty of places to eat and drink on the way, so don’t worry about going hungry. If you want to stay overnight then the best place would be the Samoeng Bungalows. The nearest ATM machines are in Samoeng. They also have a small 7-11. 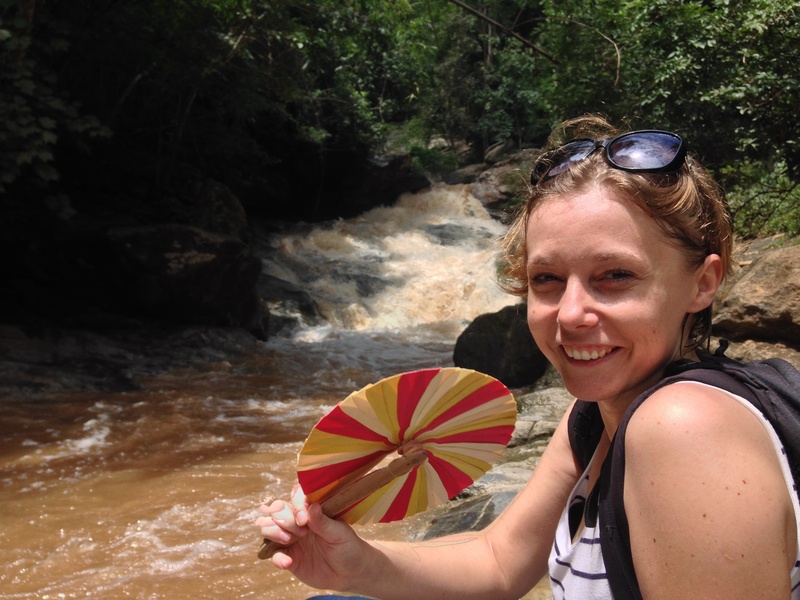 Take: a waterproof poncho (if travelling in a rainy season), sunscreen (at any time of the year), water, cash, a jumper (the temperature in the mountains is a little lower than in Chiang Mai), a map or make sure that you have Google Maps on your phone and that your phone is charged.